Diane Dewey’s descriptive and enrapturing writing in Fixing the Fates transports the reader to various moments and places throughout her life. Her descriptions of her feelings, thoughts, and perceptions are vulnerable and vivid. I found myself sneaking any spare moments during the day to read this book as it is one of those “couldn’t put it down” stories. The universal themes Diane explores in her memoir are empathy, context, self-acceptance, intuition, and grace (releasing and not harboring anger). 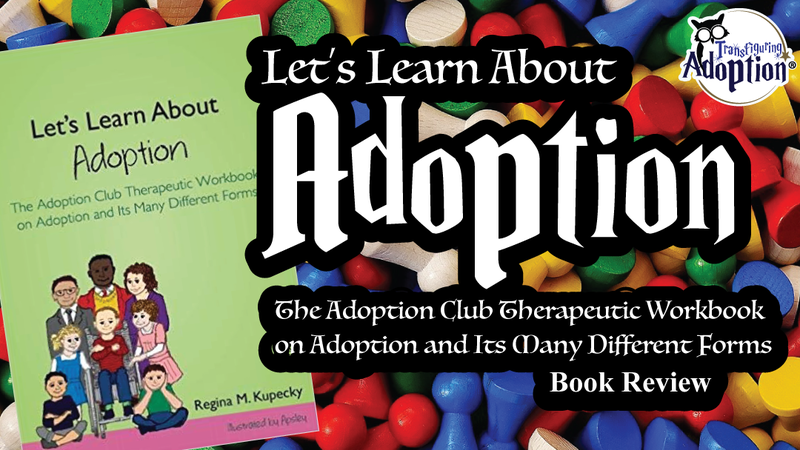 I highly recommend this book to adults in the adoption triad, but especially to adoptive parents as this is the angle from which I read the book. 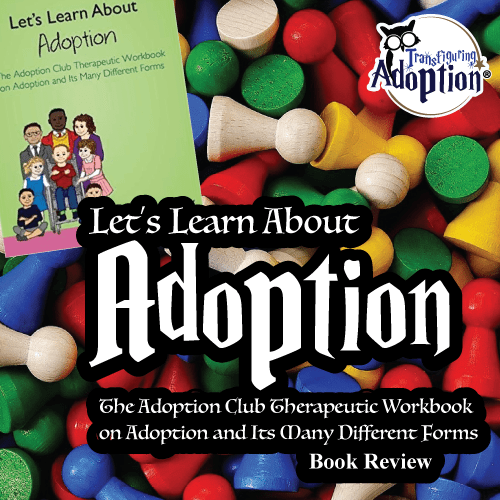 Diane not only shares her thoughts, feelings, perceptions, and experiences as an adoptee, but she discusses universal themes and best practices in adoption and mentions other important works, such as The Primal Wound by Nancy Newton Verrier and Adoption Nation by Adam Pertman. Listening to the experiences of adoptees is one of the most effective ways for foster and adoptive parents to become more informed about how to best parent their children and empathize with them. 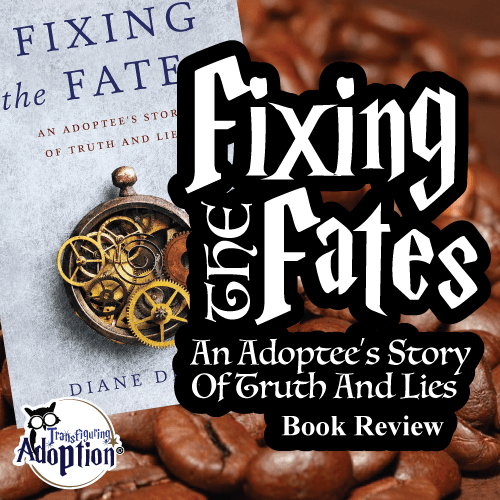 Reading Fixing the Fates makes these concepts and themes accessible to readers by bringing them into the mind and experiences of an adoptee who expresses her experiences so vividly. What insights did you gain from Diane’s book? 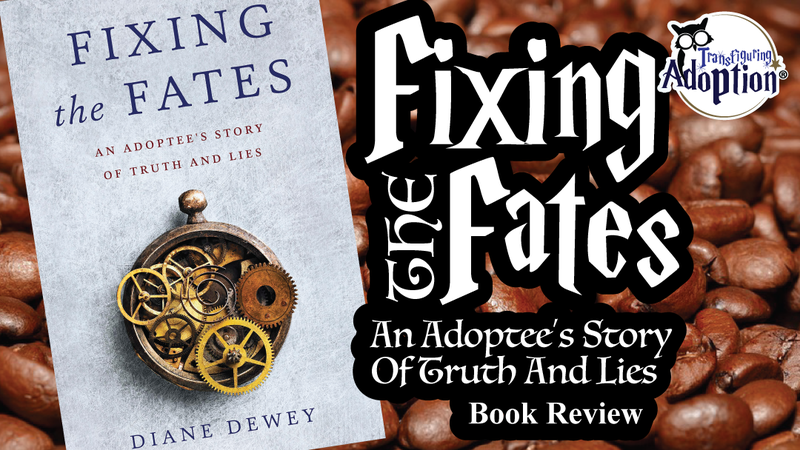 If you are an adoptive parent, has reading Fixing the Fates led you to make any changes to your parenting? Has the book changed your perceptions of birth family search and reunion? NOTE: JKS Communications provided an advance copy of this book in exchange for a review. A couple weeks ago, the movie Instant Family was released on iTunes, and Darren and I watched it for the first time. The story is based on the experiences of the producer and his wife and other families who have instantly become parents to sibling groups through fostering to adopt. There is a point in the movie during which the character Ellie is watching her three foster children join their birth mom for a visit, and she tells her husband she feels like they’re breaking up a family. He responds that they did not remove the children from their birth mom and that they are not the ones to make the decision of whether or not her rights should be terminated. While this is correct, there are further questions we all have a responsibility to ask. 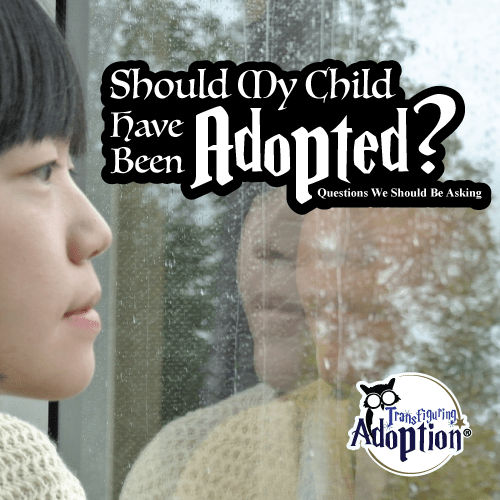 Many adoptive parents wonder, “Should my child have been adopted?” Often it is asked in the context of the parent feeling like they have failed or messed up and wondering if the child would be better off with their birth family or a different adoptive family. 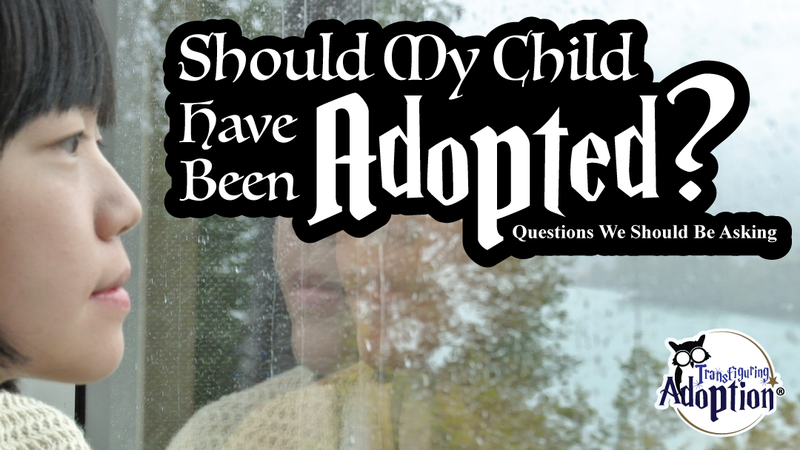 Ideally, this should be asked BEFORE a child is adopted, but adoptive parents often are not informed of real statistics, of real systemic issues, of corruption, and so on until they have been on the adoption journey for a while and begin to question whether their child should have ever been available for adoption in the first place. Outcomes are better for children if they can remain in their birth families. Ideally, no child should ever be adopted. We cannot go back and change whether a child was removed or whether they were placed for adoption or not, but we can and must take an honest look at systems in place for foster care and adoption and advocate for better for all children and families. Should the child have been removed in the first place? Were they removed because of cultural or economic differences? Was everything possible done to preserve the birth family? Was everything done to search for a relative or fictive kin caregiver for the child? Were the birth parents coerced or forced into placing the child for adoption? Did the birth parents lack necessary supports for parenting? If necessary supports had been provided, could family members raise the child? Is the child part of the 80% of children in international orphanages who are not truly orphans? Are there birth parents or family members who wanted to parent but could not due to poverty or due to the child having a health problem they could not pay for so they placed the child in the orphanage to save the child’s life? In the wake of natural disasters, or just simply living in impoverished conditions, parents and family members place their children in orphanages so they can be fed or provided with necessary healthcare. Organizations like Lumos and Love Without Boundaries have programs that are working to ensure children can stay with their families instead of being pulled from loving families and their cultures and everything and everyone they know because of poverty, disaster, or health problems. Were the birth parents lied to and led to believe that they were merely sending their child to an orphanage or another country for educational purposes and that the child would be returned to them? Was the child adopted from a Hague Convention Country? The Hague Convention on the Protection of Children and Co-operation in Respect of Intercountry Adoption (Convention) is an intercountry agreement that “aims to prevent the abduction, sale of, or trafficking in children, and it works to ensure that intercountry adoptions are in the best interests of children.” It helps to ensure that a suitable family was searched for in the child’s country of origin first. While the Hague Convention seeks to ensure the child’s best interest, it does not mean that more could not be done. Once during a training, I recall a trainer stating that parents have a constitutional right to raise their children. This right should only be taken away under dire circumstances, and it should not be removed simply because others think they could do a better job with the child or give them more opportunity. The ability to receive a better education, take part in activities, or receive superior nutrition does not undo the trauma that removing a child from their birth family causes. Science is proving this over and over the more neuropsychology and other fields are revealing about the consequences to children, even those removed at birth. Often adult adoptees and former foster youth question where we stand on issues as the co-founders of Transfiguring adoption, an organization that seeks to help foster and adoptive parents. Just because we seek to improve adoptive situations, it does not mean that we believe adoption is the best option. In many cases, it is not! Kids do better in their birth families. Adoption is not sunshine and rainbows. It always begins with trauma. More resources should be diverted to preserving families and preventing removal, and adoption should be a last resort.